The second coming of three-dimensional, or 3D, cinema has begun - in Bollywood . If the success of James Cameron's Avatarin 2009 opened the floodgates of 3D films in Hollywood, the unexpected triumph of Vikram Bhatt's 3D movie Haunted has sparked off tremendous interest in the genre in India as well. Made on a modest budget of Rs 13 crore, Haunted, which released in May this year, has already grossed around Rs 43 crore at the box office. And big production houses have taken notice. The buzz is that Aditya Chopra is likely to make his next Dhoom sequel, Dhoom 3 - as action packed as the earlier offerings - in the 3D format. Insiders also claim that Shah Rukh Khan's forthcoming film Ra.One - keenly anticipated for its dazzling computer generated visual effects - will be released in two versions: the usual two-dimensional, or 2D, format, as well as in 3D. The film has been shot in the conventional format, but the actor is said to be in talks with studios to prepare 3D prints too. Bhatt himself is making another 3D film, Dangerous Ishq, billed as a 'supernatural thriller', financed by DAR Motion Pictures, part of Dubai-based DAR Capital. Indian producers have also noticed how well some of the recent 3D releases from Hollywood have done in India. 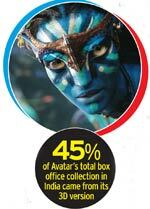 Avatar, the trailblazer, grossed Rs 110 crore - a record for Western films, of which 45 per cent came from the 3D version. Transformers: Dark Of The Moon and the recently released Harry Potter and the Deathly Hallows have both been immensely successful. Viacom Motion Pictures India, which distributed Trans-formers…, says almost 60 per cent of its collections so far this year came from 3D versions. Whenever both conventional and 3D versions of the same film have been released, the latter has always done better. Industry insiders esti-mate that in the next few years Hollywood's share of movie collections in India will rise to 15 per cent from about 4.5 per cent in 2010 - thanks to its 3D fare. Around 35 3D Hollywood films are scheduled to be released in India this year. Strangely, though the basic technique for making 3D films has been known for nearly a century, Haunted is only the second 3D film made in India. The first was the now-seminal Malayalam film My Dear Kuttichathan in 1984, which was later dubbed in Hindi - Chotta Chetan - and several other Indian languages. With the current renewed interest in 3D cinema, it is being released again in September. "Everybody finds there is money in 3D, especially after the success of Avatar," says Jijo Appachan, director of My Dear Kuttichathan. "So when a distributor suggested a rerun, I said okay." The movie, a raging hit, has already earned 60 times its initial investment; yet no other filmmaker before Bhatt cared to follow in Appachan's footsteps. Why not? Filmmakers claim theatres in India did not have the technology in place to screen 3D movies; theatre owners retort there were never enough 3D movies being made to warrant the investment to make their screens 3D enabled. But the Hollywood 3D bonanza of recent years has prompted a change. Film technology company UFO Moviez has developed a 3D compliant technology which has already been installed on 110 screens across the country on a revenue sharing basis. Currently it costs roughly Rs 10 lakh to convert an existing 2D screen to 3D, say industry insiders, while to build a new 3D screen costs around Rs 30 to 35 lakh, depending on the technology adopted. "The plan is to have 1,250 3D compliant screens in the next two years," says Rajesh Mishra , C E O , Indian Operations, UFO Moviez. 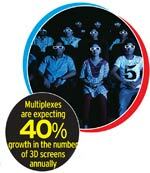 All the major multiplex chains expect 3Denabled screens to grow by about 30 to 40 per cent annually. Theatre owners expect to quickly recover their investment considering that 3D films are currently generating two to three times the revenue per theatre than the conventional format. "3D today is what Dolby (surround sound system) was 10 years back," says Pramod Arora, Group President of the PVR chain of cinemas. "3D gives us repeat audience." Already some Indian companies have become so adept at converting conventional films into the 3D format that Hollywood has begun outsourcing work to them. Mumbai-based post production and visual effects studio Prime Focus has just completed the conversion of Chronicles of Narnia: Voyage of the Dawn Treader into the 3D format, using its own proprietary software called View D. Other films it has on hand for conversion is George Lucas's classic Star Wars: The Phantom Menace, which is slated for release in February 2012. While some Indians may have mastered the technology, filmmakers complain that there are not enough of them yet. Haunted, for instance, used a number of foreign technicians. "Getting talented people with full knowledge of the 3D medium is a challenge," says Arun Rangachari, co-producer of Haunted. "There are no experienced stereographers in the country." Another challenge is the film's production cost, which rises by 35 to 40 per cent if it is made in 3D without technical compromises. Again, not all kinds of feature films are likely to work in the 3D format. The challenge lies in getting the right content visualised in 3D. "The genres that will work are horror films, thrillers and action movies," says Rangachari. "These have underperformed in India so far, but will pick up with the coming of 3D," adds Vikram Malhotra, Chief Operating Officer of Viacom 18 India. A more worrying trend, however, is that in the West, the 3D mania seems to have already waned. Digital projectors and 3D-enabled screens are everywhere, and yet the proportion of box office collections that comes from 3D films has dropped this summer in the United States. The conventional format of four recent blockbusters - Pirates of the Caribbean: On Stranger Tides, Kung Fu Panda 2, Green Lantern and Harry Potter and the Deathly Hallows - has done better than the 3D version. "Producers have learnt that 3D is no guarantee of success," says Vincent Teulade, author of a September 2010 report by PriceWaterhouseCoopers which was extremely sceptical about the future of 3D films. The massmarket potential of 3D entertainment remains uncertain, because of the wide gap between the availability of 3D-ready equipment and quality 3D entertainment content, he adds. So is the trend likely to die? Most are convinced it will not. "There has been too much investment in 3D technology for it to be a momentary fad," says Roger Pollock, Executive Vice President, Paramount International Pictures. Haunted, India's first stereoscopic 3D movie, released in May 2011, was made on a Rs 13 crore budget and earned Rs 43 crore at the box office. Indian experts maintain that the 3D format alone may not be enough; the total viewing experience should be satisfactory. "Viewers go to theatres for a full cinematic experience," says Anil Arjun, CEO of Reliance Media Works. "Even the slightest lapse in format and technology use can deter the audience." Chief Creative Director of Prime Focus Merzin Tavaria echoes his sentiments. "The viewer needs a perfect balance between the technology and the storyline rather than pure entertainment," he says. "It is all about giving depth, foreground and background to visuals to maximise the impact. It is a process of sculpting." The future of the format looks even brighter considering that 3D television screens are also being developed. These do not even require viewers to wear special spectacles, as they have to in a movie theatre. 3D enabled Blu Ray Discs are already in the market. In Hollywood, the home video segment accounts for almost 50 per cent of collections. In India too, the segment is rapidly growing.